Homemade Strawberry Shortcake is the perfect summertime snack or dessert recipe. Easy to make with only 4 ingredients and it’s low calorie! Strawberry shortcake is the perfect summer time treat! Don’t worry, you can keep your diet with this delicious treat. My 10-year-old daughter helped me makes these. 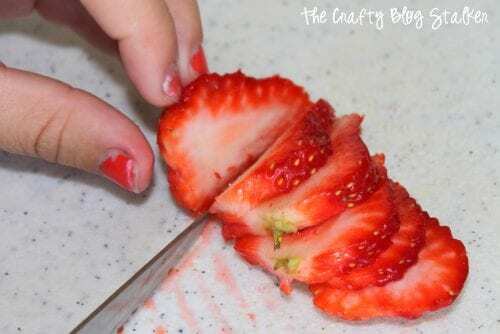 She started by cutting off the leafy tops and slicing the strawberries. 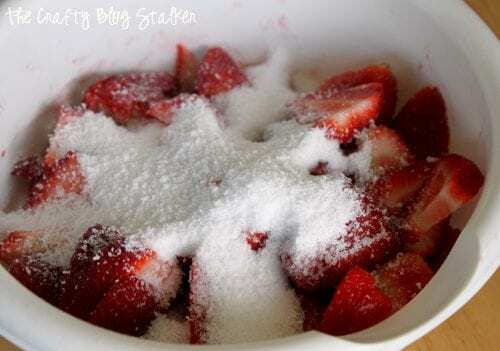 Put all the slices into a bowl and add 1/2 Cup Splenda. 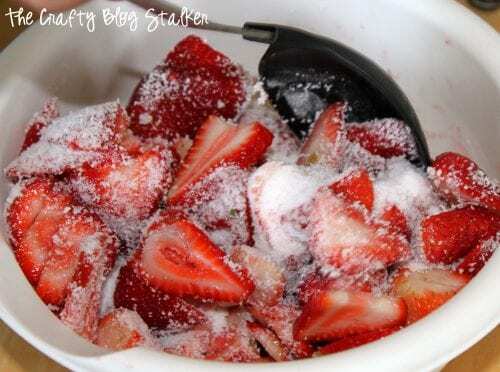 Stir until the sugar is well mixed and coats the strawberries evenly. Put a lid on the bowl and set aside in the fridge. 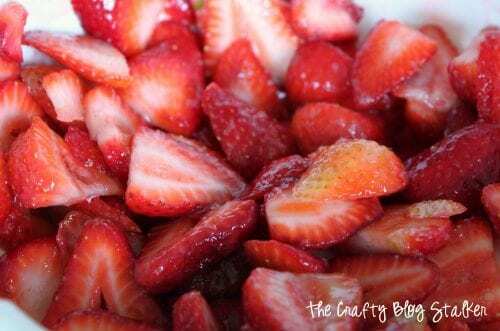 When you let it sit for a couple hours, the Splenda will create a natural strawberry syrup that is delightful! This is what they will look like after a while. The longer you let them sit the more syrup they will create. When the strawberries are ready you can begin layering the shortcake. This is the fun part because you can add as much or as little of the toppings as you would like. I start with 1 shortcake, a scoop of fat-free Whipped Cream, a spoonful of strawberries and then repeated for a Double Decker Strawberry Shortcake. That means my huge double decker Strawberry Shortcake is 320 calories, but I could have easily only had 1 shortcake with half the whipped cream and strawberries for 160. Now that is not a bad dessert – and delicious too! What is your favorite low-calorie dessert to indulge in? Share and leave a comment below! 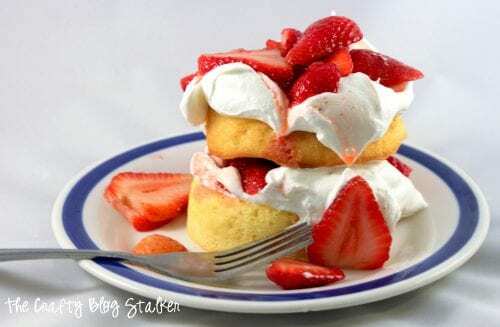 SAVE HOW TO MAKE LOW-CALORIE STRAWBERRY SHORTCAKE TO YOUR FAVORITE DESSERT RECIPE PINTEREST BOARD! Yum! These are my favs! Yum!!! I love strawberry short cake 🙂 Well, I pretty much love strawberry anything! We were making strawberry crepes this weekend and my hubby thought of a super smart and super quick way to slice strawberries….here is the link to what he did! perfect!! and the strawberries are in season now!! I love the recipe. This looks delicious and perfect for a summer dessert. I love fresh strawberries. Thanks so much for linking up to Creative Thursday this week. I can’t wait to see what you link up next week. Have a great weekend. This looks absolutely delicious! I seriously cannot wait to try it. I am picking up the ingredients tomorrow! I love strawberries. This looks delicious! Thanks for sharing at Terrific Tuesdays. I love strawberry short cake!! I adore it in double decker form!! :) Thanks for sharing with us at Link It Up Thursday. Mmmm! Anything with strawberries is a HIT in my book! This looks soo yummy.. I would eat that for breakfast and dessert! I’ve been looking for a good and fast recipe for this dessert! I think I just hit gold with yours, love it! Thank You for posting! Thanks for your nice shortcake recipe. The strawberries are really looking so good. Just downloaded the pdf file for trying it soon. MMM, strawberries) This looks soo yummy.) I am picking up the ingredients tomorrow!